Roma, Italia, September 13, 2013 – With the backdrop of St. Peter’s Basilica at the grounds of Urbaniana University, twenty two chaplains and pastoral workers for the Filipino communities from twelve dioceses in Europe and the Gulf excitedly gathered for the 10th Regional Consultative Meeting for the Filipino Ministry last September 10 to 13, 2013 at the Centro Internazionale di Animazione Missionarie or CIAM. Organized every two years by the Episcopal Commission for the Pastoral Care of Migrants and Itinerant People (ECMI) of the Catholic Bishops’ Conference of the Philippines (CBCP) the participants were cordially welcomed by the assistant chaplain, Fr. 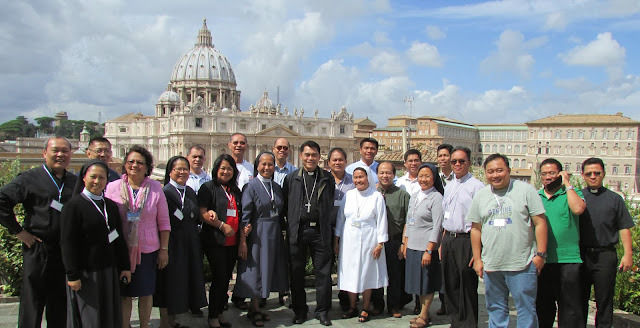 Ricky Gente and the five religious sisters assisting the Filipino chaplaincy in Rome. The meeting began with the opening liturgy animated by the chaplaincy of Rome. It was immediately followed by the solidarity message of Msgr. Pierpaulo Felicolo, the director of Fondazione Migrantes – Roma. Speaking in Italian, he claimed that he was very fortunate to be invited at the meeting of Filipino migrant chaplains who had chosen Rome as its venue. “The Filipino migrants are well loved in Italy and are well esteemed by their Italian employers. Unlike those coming for example from Albania and Romania to Italy, their presence was likened to the way the Italians were treated in Belgium or Switzerland many decades ago. They were despised by the country that hosted them,” he disclosed. He continued with his message declaring that his office is to help pastorally the migrant communities in the Roman diocese to settle smoothly. 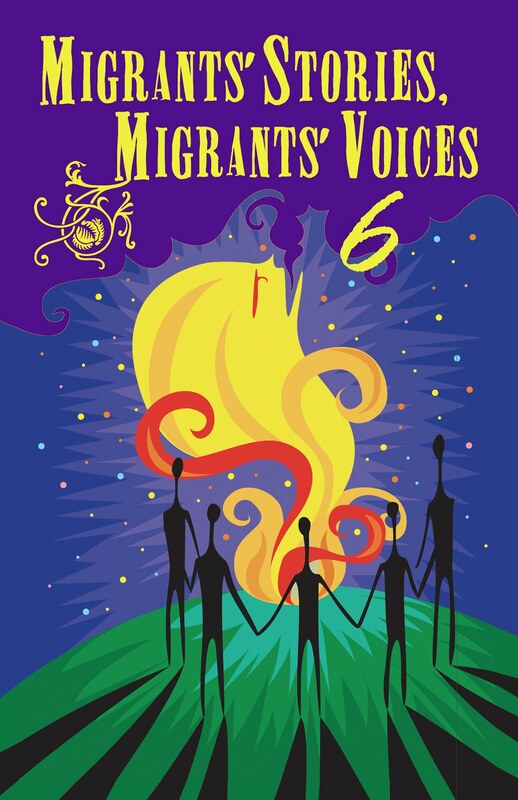 The diocese of Rome journeys with the various migrants coming from the four corners of the world acknowledging them with their distinct music, their particular culture and language. The diocese of Rome is in a constant journey with the migrant Filipinos and their families. According to Fr. Ricky Gente and the other nuns working in Rome, Msgr. Pierpaulo Felicolo tries to be present always at the formation seminar provided to the forty six Filipino communities existing in Rome. Towards the end of his talk, he had expressed hope that this meeting will bring out better pastoral intervention to the Filipino migrants. Fr. Bubi who is based in the General House of the SVD in Rome stressed in his presentation that personal relationship with the people they minister must be developed in order for them to be effective witnesses and not just carrier of the message of the Gospel of Jesus. “We must learn to form real community not necessarily small community as many of them are really very small and refuse to integrate or form relationship with others,” he stressed. Born in Essen, Germany in 1958, Fr. Bubi as he is fondly called by many Filipino SVD confreres had worked in the Philippines from 1972 until 1994 until he was called to work in their general administration in Rome. “Our faith must be contagious or infectious,” his reminder to the pastoral workers and this is for him the evangelizing quality in the human relationship among missionaries and the people they serve. In his opening remarks, Bishop Precioso Cantillas, SDB, DD, the outgoing chair of ECMI spoke on the “Thirty Years of Faith Accompaniment among OFWs”. He reminded participants of this faith accompaniment as an expression of the CBCP’s commitment towards the overseas Filipinos and such deserves to be continued with further enthusiasm. He moreover invited them to assist the Filipino migrants in understanding the value of our faith as the Philippine Church prepares for its 500 years centennial celebration in 2021. The opening remarks of Bp. Cantillas set the tone of the individual report of chaplains. The first chaplain to deliver an update of what transpired after the meeting in Zurich in 2011 was Fr. Simon Boiser, an SVD missionary based in Berlin. Armed with power point presentation, he narrated the various activities of the Filipino chaplaincy in that German capital. Many of the participants were first timers to the meeting hence the enthusiasm was high. Among the chaplains who took turns to deliver their own report were Fr. Ronnie Lacanienta of Bergamo; Fr. Ben Barrameda of Kuwait; Fr. Vicente Castro Jr. of Madrid; Fr. Mark Jeben Diola of Padova; Fr. Lyndon Balubar and Dani Visda of Paris; Fr. Edwin Literato of Siracusa; and Fr. Julipros Dolotallas and Fr. Antonio Enerio of Switzerland. Other participants of the regular assembly of European chaplains were Fr. Jun Deocampo of Cologne; Fr. Rene Esoy of Dublin; Fr. Ricky Gente of Rome; and the national director for the Filipino ministry in Italy, Fr. Elmer Bumanglag. Their chaplaincy’s report was centered on the activities of their community. Some conveyed concern over the changing attitudes of Filipino migrants towards the Church in the region. One major observation that some chaplains shared in their report is the changing way of life and mentality of the Filipino migrants in Europe. Understandably, the behavior and culture of the host country is also a factor. After four decades of continuous work in Europe, many Filipinos have decided to adopt the citizenship of their host country. This change has come after having successfully brought their children to live with them through a family unification system. In the past most migrant Filipinos were merely aiming to go back to the Philippines to retire. This is no longer the case when asked about their plans. Many of those who have adopted a new citizenship conveyed that their motherland could not provide them practical reason to return. Until the country show signs of economic stability and better opportunities would they reconsider coming back. However, they would love to come only for holidays. Although some are also thinking about returning, but for many, their children are decided to stay put. Many of those who have bought properties in Europe are now torn between staying with their children and going back home for their retirement. These are few of the examples shared by the chaplains who had attended the consultative meeting in Rome. With the global economic slump that also hit Europe, several Filipinos complained that they do not have anymore the luxury of choosing jobs. Many have also lost their jobs and could not also complain about their salary cut. Some were reported to have problems paying for the property mortgage especially among those who had decided to settle permanently in Europe. Just like the Europeans now they too face the same reality of job insecurity and financial woes. With the changing priorities that come with their European integration, many of them are not even coming to church. Everyone seemed preoccupied of finding part time jobs to augment their income even during Sundays. Among the second generation Filipinos, referring to the youth, many are not going to Church. One of the chaplains even claimed that some Filipino youths have become members of a satanic cult. The chaplains found some difficulty addressing the needs of the youth. This issue was also raised consistently in the previous consultative meetings in Dublin, Jerusalem and Zurich in 2007, 2009 and 2011 respectively. Apparently, some chaplains have a hard time addressing this problem as many of them had failed to offer a practical possible solution. As in the past, besides their meeting, prayers and liturgical celebrations were likewise animated by the chaplains and pastoral workers. In the afternoon of September 12, 2013, the participants went to the basilica of S. Pudenziana, the seat of the Filipino chaplaincy in Rome to celebrate the Eucharist with the Filipino community. Afterwards they were treated to a hearty Filipino dinner. The dinner was followed by karaoke singing that allowed participants to enjoy taking turns in the microphone exhibiting their vocal prowess. Not every chaplain invited to the meeting was able to attend. Earlier that week, Fr. Gestie Advincula, CM, the chaplain of the Filipino community in Beirut, Lebanon had informed the organizer that he was withdrawing his participation from the meeting due to the escalating tensions happening in Syria. He feared that he will not be able to return to Lebanon in the event that the US would take action against Syria. Moreover, Fr. Virgilio Bago Malgapo the outgoing chaplain of Ibiza, Spain, had sent his report but due to lack of time, it was not read by the organizer. He too had apologized for his inability to join as the new chaplain will soon be replacing him. Everyone enjoyed the presence and company of each other especially during meals and coffee breaks where lively sharing of experiences of their mission were exchanged. On the last day of the consultation, it was agreed that chaplains support the second collection that was approved by the CBCP during the celebration of the National Migrants’ Sunday in the Philippines. The executive secretary of the ECMI will send them a letter related to this activity. Furthermore, the participants had approved that the next meeting will be brought to the Gulf region. The chaplain of Kuwait volunteered to host the 11th regional consultative meeting in August 2015, once his bishop agrees. Then, Kuwait will become the second country to host the meeting outside Europe. It must be remembered that Israel hosted the 8th consultative meeting in Jerusalem last August 2009.